On March 22, 2012, French commandos surrounded a building in Toulouse where an Islamic extremist was holed up after a shooting rampage that had already left six dead. The team needed to get inside the apartment where the suspect had barricaded himself. The problem was they didn’t have a clear picture of the situation—at least not until a mini reconnaissance robot from ReconRobotics came into play. 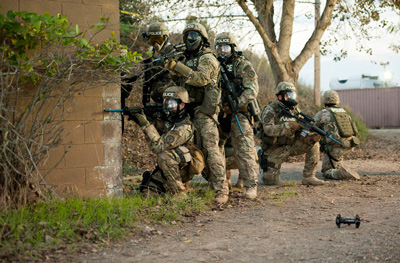 The team threw the unit—the ReconScout XT—onto a landing in the zone of fire, where it peeked through an open doorway and began transmitting images, allowing the team to pinpoint the suspect’s location and monitor his activities. The information allowed the team to successfully end the standoff and subdue the suspect without further loss of life. 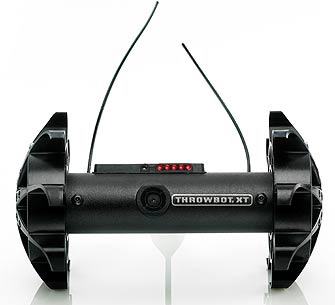 That robot was an earlier version of Recon’s new 1.2-lb Throwbot XT, a micro unmanned ground vehicle that can be deployed—or thrown to be exact—from up to 120 ft. away to stream video and audio feed of a scene. Tough enough to survive a 30-ft drop onto concrete; the unit can traverse rough terrain and operate for up to an hour on a single charge, courtesy of small, high-power DC motors from MICROMO. When it comes to armed conflicts, particularly in urban environments, situational intelligence is a key advantage. About the size and shape of a 10-pound dumbbell, the Throwbot consists of a pair of 4.5-in-diameter wheels linked by a 1.5-in diameter, 6-in-long crossbar, for an overall width of just fewer than 8 in. 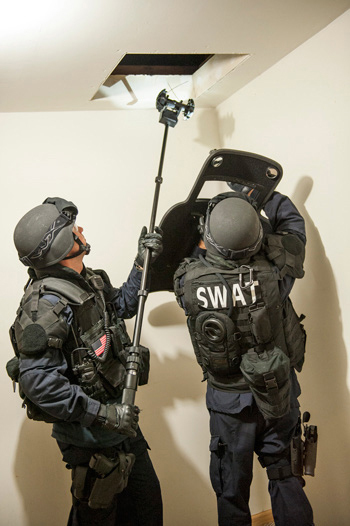 The unit’s small size allows it to maneuver through small openings and to gather intelligence unobtrusively. In designing the robot, the ReconRobotics team faced a number of conflicting performance requirements. The Throwbot needed to be light but extremely rugged. It needed to have the muscle to fight its way over uneven terrain and yet remain efficient enough to provide long-term operation powered by the smallest possible battery. Above all, it needed to be reliable enough to deliver a steady stream of information in situations in which lives might hang in the balance. The team started with titanium housing, coupled with polymer wheels to absorb shock. Delivering the performance required in a limited form factor presented a challenge. With the exception of the wheels and the antenna, all of the elements of the robot have to fit within the crossbar. The system features an electronic vision sensor with IR capabilities to stream video of the scene, leveraging output from a row of IR LEDs to provide illumination in lowor even no-light conditions. A variety of channel choices allows multiple robots to be used independently in the same area at one time. Intuitive and precise positioning and control of the robot by the human user is achieved through closedloop feedback from specialized sensors overlaid on the human user’s input reference from the joystick. Although the robot is piloted by an operator using the joystick, the system delivers feedback in order to permit the robot to do things such as drive straight without the operator having to fight the joystick in a stressful situation. “The robot should help the human as much as possible, making their job easier and requiring as little extra attention as possible from the user, but in a manner that the user does not even notice the corrections that the robot is making for them,” says Casey Carlson, a product management engineer with Recon. An encoder might be the obvious choice, but space limitations in the crossbar ruled out that option. Instead, the design uses a gyroscope and accelerometer, which provide the feedback to correct the offset from what the user intends. These sensors enable more intuitive control of the system by the user in many other ways. Each wheel of the robot is driven independently by a 10-mm-diameter, high-power-density DC motor from MICROMO. “The very first motor we chose from MICROMO for the initial version of our robot was able to take a huge amount of over-volting, or driving of the motor at a higher voltage than specified, at the tradeoff of lifetime since our life requirements were somewhat less than those specified by MICROMO,” says Carlson. “When we sought another motor from MICROMO for increased performance, the assumption was that we could achieve a similar performance multiplier from a similar, though larger, motor.” However, when the team attempted to push the new motor far past specifications, they found that it could not tolerate as much abuse as the initial model. “Our first motor from MICROMO gave us great performance when driven at 10 V—a full 4 V over the specified 6 V. But when we tried the same push on the larger motor we came up short.” So the team went back to MICROMO to get some advice from their experts. One of the biggest challenges for the design team was ensuring reliability. In these types of applications, failure is not just an inconvenience—it can be a matter of matter of life or death. The robot is designed to be deployed by casting it into the theater of operations. That means it lands hard, applying a high shock load to the drive train. When the wheels hit the ground after being thrown, the angular acceleration applied to the wheels during landing is extreme enough to torque off the drive shaft of the motor or strip the gearing and damage the motors further. ReconRobotics solved the problem mechanically, adding a clutch to decouple the wheels from the motor during high stress events. The torque of the clutch is designed to be just above the maximum torque of the motor, thus not wasting any energy due to the motor causing slippage of the clutch and not transferring that energy to the wheels. When a higher torque is applied during impact, however, the clutch disengages and allows slippage of the interface between the wheels and motor, preventing the shock of landing from reaching the motor and gear-head. The value proposition of the robot lies in its ability to gather and send information, and that’s where the ReconRobotics team focuses its efforts. When it comes to manufacturing, they leave the motion to MICROMO. The micro-motor specialist doesn’t just sell them a servo motor, it delivers an integrated assembly consisting of motor, gearhead, and cabling. As a result, the modules arrive at the factory already tested and operational, saving manufacturing time and allowing the ReconRobotics team to focus on the elements of their project that differentiate them. “The more plug-and-play we can get, the better,” says Carlson. To date, ReconRobotics has deployed thousands of its reconnaissance robots throughout the world. Although the Throwbot is relatively new to market, the response from customers has been very positive, which Carlson attributes in part to the performance of the motors. The 1016-S Coreless DC Motor —the standard version of the motor comes with gold brushes. To make the motor robust enough to tolerate over driving, MICROMO used silver brushes and added a capacitor ring that minimized damage from arcing. The team also modified winding to optimize output. The 10/1K planetary gearhead — a steel gearhead with preloaded ball bearings. It introduces a 64:1 reduction ratio. The ReconRobotics solution goes beyond just components, though. In addition to the value-added engineering, MICROMO’s test lab conducted performance, lifetime and failure analysis to ensure these custom solutions met application requirements. The company also terminates the gearmotors by soldering custom cable assembles to the terminals, as well as mounting a pinion on the front shaft. These modifications offload assembly responsibility to MICROMO, simplifying Recon’s procurement process, guaranteeing a working product, and streamlining production/assembly capacity.